Co2mmunity is a network of organizations scattered across eight different countries in the Baltic Sea Region (BSR). Our common goal is to facilitate community energy (CE) project development as part of a transition to renewable energy sources and create an understanding among stakeholders. Instead of working in isolation, we exchange ideas and experiences while continuously supporting one another. Doing so will help us provide knowledge to other practitioners and policy makers which will lead to long term success. The infographic below shows the different outputs of our project, and you will find much more information in the text that follows. The Co2mmunity project is co-funded under the INTERREG programme by the European Regional Development Fund alongside the project partners’ own contributions. 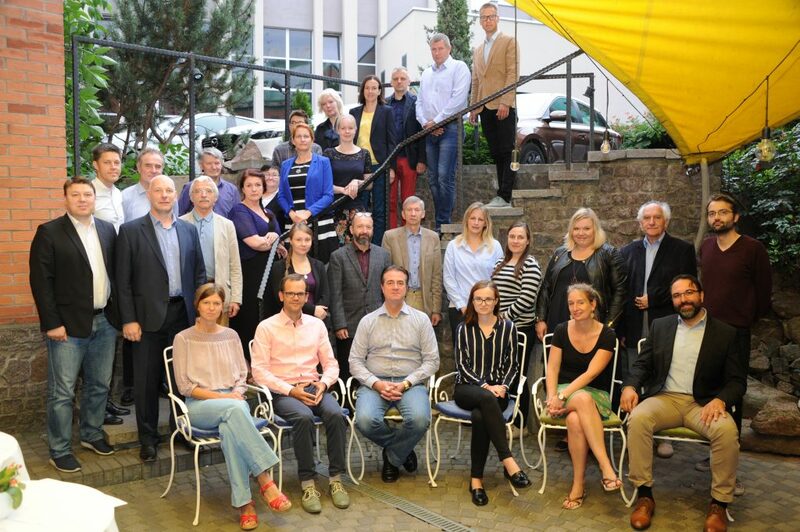 The project partners consist of 15 organizations including government, energy agencies, a municipal utility, and universities from eight different countries surrounding the Baltic. The Project Partners page provides additional information regarding the partners and their roles in Co2mmunity. CE projects offer generation of renewable energy (RE) from local sources such as solar, biomass, hydropower, and geothermal. Projects are developed and implemented through active participation of local communities, in which citizens work together to co-finance, co-develop, and co-operate RE plants. Sustainable energy distribution, such as local heating networks and biogas filling stations have a greater chance of success as CE projects. Furthermore, through active communication, transparent decision-making, and local benefit sharing CE projects have high social acceptance. All in all, fostering CE projects is highly promising for increasing the share of RE in the BSR. There are currently no comprehensive documents concerning CE in the BSR. One of Co2mmunity’s objectives is to fill this knowledge gap. From our shared experience we create this CE knowledge base to help enhance the institutional capacities to suport local communities. These benefits will not only be felt by municipalities, but also institutions responsible for regional energy planning, political decision-makers, and both energy and citizen’s associations that facilitate CE projects. Of course, we hope that our pilot projects across the BSR will bring immediate benefits to the citizens and organisations involved. Renewable energy cooperative partnerships (RENCOPs) are the core of Co2mmunity. A RENCOP is a local partnership that initiates and supports CE projects based on renewable energy sources. In each country, the local Co2mmunity partners will initiate and manage a RENCOP. 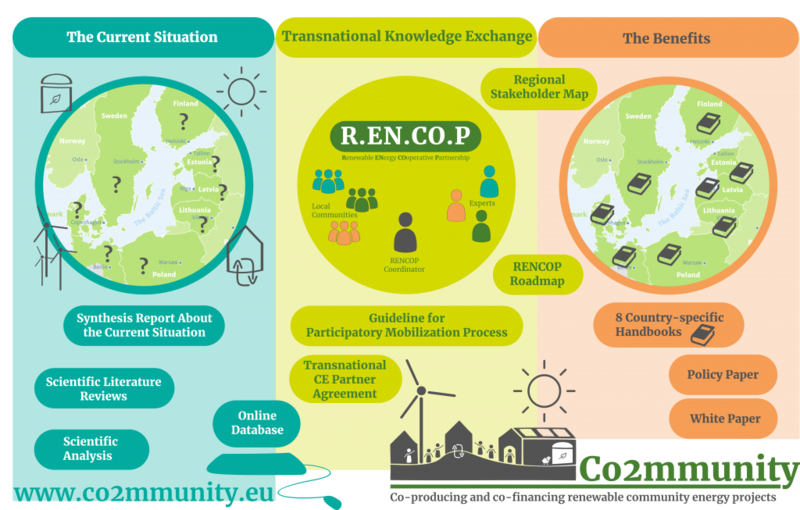 The transnational exchange of experiences with local RENCOPs in the Co2mmunity project will result in a transferable RENCOP model and roadmap. This will be enabling a transnational catch-up process between frontrunners and followers as well as enhancing the capacity of local, regional, and BSR-wide actors to foster CE. Beyond this, Co2mmunity will develop a synthesis report on the current CE situation in the BSR, including a compilation of case studies. It will showcase success factors of CE projects that are transferable across contexts. We will also develop locally specific CE handbooks and white papers for public stakeholders. Co2mmunity’s planned outputs are detailed below and additional information on our current activities can be found on our RENCOP and CE project pages, as well as the project database created for Co2mmunity. To support community energy projects, Co2mmunity studies, initiates, and develops regional partnerships of active organisations within the field of RENCOPs. The work is organised in three work packages that all have their own outputs.